This is a private and non-commercial website. To use the website you do not need to have cookies enabled. Any cookies that are utilised will not harm your computer. Cookies do not store personal information, they are primarily used to resolve errors and ensure you have an easy experience when using the site. However, if you would like to restrict the level of cookies that are stored on your computer, you can use your browser to do this. All browsers and mobile phones are different, so check the ‘Help’ section to learn how to change your preferences. 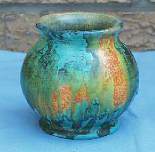 It only covers the period of pottery production and it is hoped that more information can be sourced. As more facts and examples come to light it will be updated so do come back later. If you know of any additional information use the Comments Book at the end. Godden(1964) only records two 'back' marks, one for Brown & Steventon and one for J.Steventon & Sons Ltd however various others have been found and the gallery shows the wide range. Three artist had their own back stamps and these are featured later. 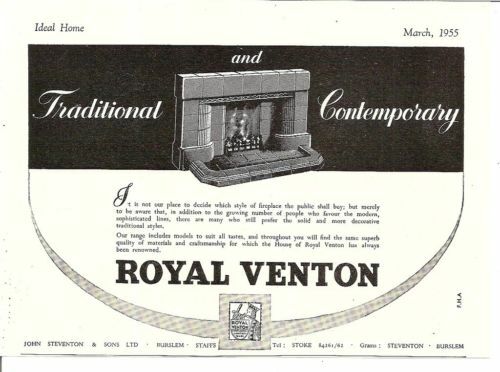 Although the name of 'Royal Venton' is still used today as part of the Ideal Standard Group (Bathroom Ware) pottery as shown and described is no longer made. 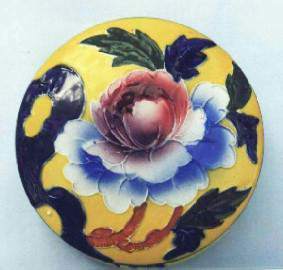 The firm was first established in 1897, although a some back marks have shown 1895, and pottery was produced until the mid 1930's, usually quoted as ending in 1936. The main production was at the Hill pottery site in Burslem. Production at the site goes back at least as far as 1736, when John Mitchell. a manufacturer of salt-glazed stoneware was working at Hill Top. He was later to become a patron of John Wesley. The young Aaron Wood became one of the employees there. Mitchell was made bankrupt in the 1780s and by 1786 the works was in the hands of John Robinson, who eventually also took over the old Methodist Chapel. This had been built in 1766 on the adjoining site given by John Mitchell and was turned into a warehouse by Robinson By the early 1830s the pottery had been passed from the Robinson family to Samuel Alcock, who incorporated it with two neighbouring pot works and reorganised the whole as the Hill Pottery. Four hundred 'hands' were employed there by that time. The works itself was described in the early 1840s as 'one of the largest and best conducted in the Potteries'. Samuel Alcock and Company, who made good porcelain, bisque, purian vases and figures failed in1859. In 1860 the works was taken over by Sir John Duke and Nephews (J & C Hill) who sold it to Thomas Ford in 1865. 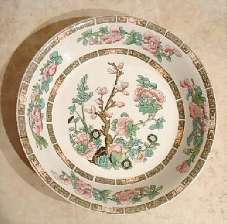 He in turn sold it in 1866 to the Earthenware and Porcelain Company. This operated for a year as the Hill Pottery Company and was then liquidated. Thomas Ford bought it back in 1867. The China Department as taken over by Alcock and Diggory (Bradley & Diggory) in 1870 and. as the Crown Works, was then in the hands of the firm Bradley from 1871 until at least 1892. 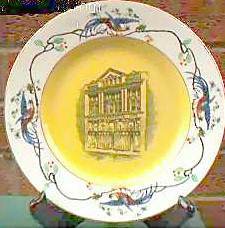 The earthenware department passed in 1867 to Burgess & Leigh who held it until 1889. 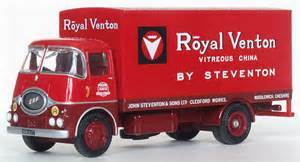 John Steventon arrived in the Potteries from Oakengates, Shropshire and had been employed by Shelton Iron & Steel Ltd. In 1890 he was described as a China Decorator on the Birth Certificate of one of his children and in 1898 he was described as a Licensed Auctioneer on another. In the 1901 Census he is listed as an Earthenware Manufacturer. It is known that a partnership was formed in about 1896/97 with William J Brown, W Lees & John Steventon with a limited capital of £300. 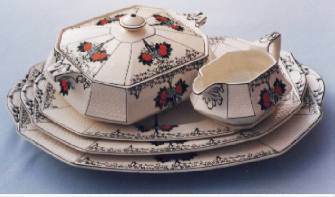 To date no examples of this ware are known but it is believed that at the time the sales were mainly to markets. 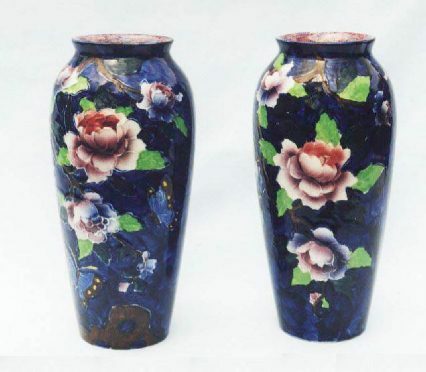 On the 18th September 1900 at an auction held by Messrs Henry Steel & Sons, the works known as Hill Pottery, Victoria and Hill China Works were purchased but the price is not known. About 1913/14 the partnership was continued as a Private Limited Company and named as Brown & Steventon Ltd. In the mid 1920's a factory adjoining the Hill Pottery works was purchased. The negotiations were with a Mr Tellwright of Sneyd Collieries Ltd and a condition of purchase was that there would be no further claims for subsidence. Although further subsidence did occur no claims were made. Further acquisitions were made. The Salvation Army and Liberal Club facing Market Place were purchased and used as slabbing shops. The Chapel in Westport Road, used at one time by Parkers Brewery Brass Band was bought, together with a wholesale stationary warehouse. During the Second World war (1939-1945) both factories were used a stores for the Government. 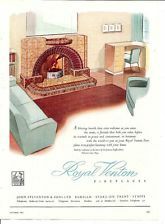 The advert is printed as Brown & Steventon, Royal Pottery, Market Place, Burslem, c/o the London Showroom of Mr E.C.Hales, Gamage Building, Holborn Circus. Not that many examples have been found, so pictures of the range are limited. Most are found as Willow ware. However some Chintz designs have now been found and these are illustrated. In about 1922 the agent was replaced by a Mr J.E.Holt. Read a trade review from The Pottery Gazette dated February 1922. Another review was printed in August 1922. 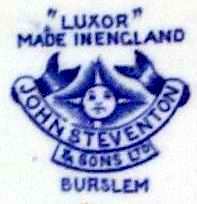 In 1923 when W Brown left the company it became solely John Steventon & Sons and continued with the manufacture of earthenware until about 1936. Some books though have stated an earlier date of 1934. 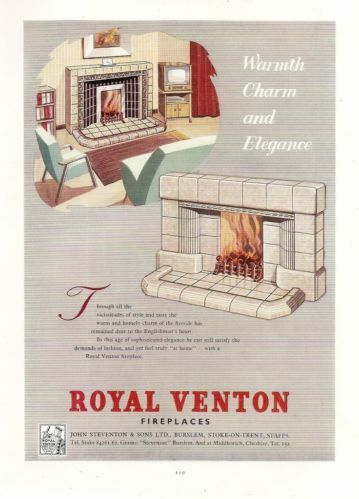 It is understood that the name of 'Royal Venton' came about following a purchase by a member of the Royalty at an Ideal Home's exhibition. Early work - After Brown left the back stamp became John Steventon & Sons. Galleon - Again no mention of Royal. but with a very distinctive back stamp. 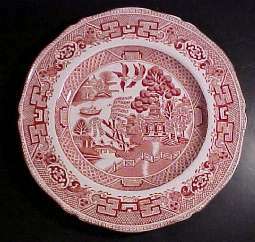 Examples found so far have only generally been as plates. However a recent e-bay auction had a twenty six piece set which included 6 - 9" plates, 5 - 6" plates, 4 cups and 4 matching saucers, 6 4-3/4" dishes and 1 - 9-1/2" long oval serving bowl. 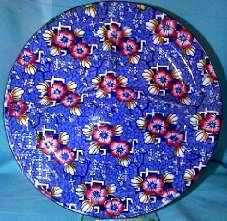 Chintz - This was carried through after Brown had left and one design is known as 'Luxor' and it is featured here as a divided lunch plate. Willow - Earlier examples before the Royal statement was added. The blue is usually very bright with a brilliant white ceramic. It is also found in green and red. Sometimes this type of Ware is described as 'Flow Blue' so where this has been stated this link collects all the pictures that carry the description. Art Deco - During this period three artists are known to have had their own back stamps and examples of their work are shown. Marked with her own logo and signed 'Hand Craft' Gladys Scarlett. Nursery Ware - A range of nursery/children's ware all featuring hand painted elephants . Whilst the shapes are the same, each set is individualised by being painted differently. The most sought after variations are as pirates. 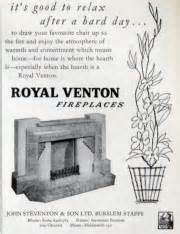 Holdcroft left Royal Venton in 1933. 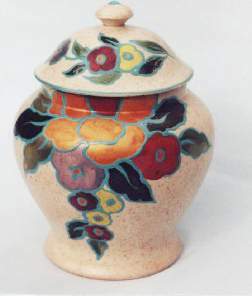 Lustre Ware- Characterised with bold splashes of colour and usually depicting fruit. Quite a range of examples has been found and different shapes are still appearing. Van Philips - ( also signed as Francis Phillips). 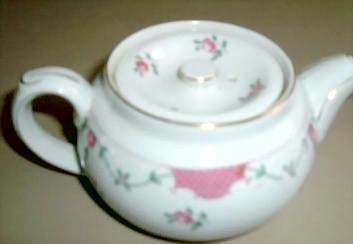 Floretta Ware. 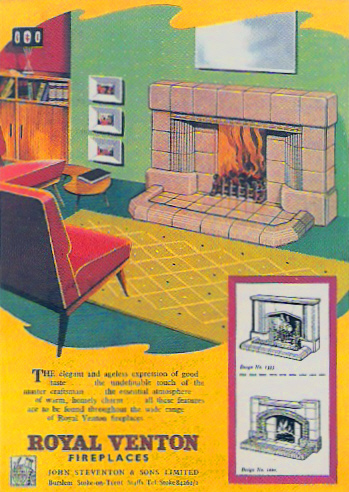 The ware was launched in late 1931 and was featured in the 'Buyer's Review' of January 1932. The first advertisement for the new ware appeared in the next month's issue February 1932. 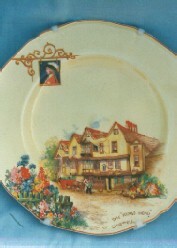 In the following year January 1933 it was the subject of a another 'Buyers Review' where it was stated that 'the house had embarked upon, at no inconsiderable expense in modelling, a suite of well over a hundred pieces in the new "Floretta" ware, a modernistic treatment in pottery depending as much for its success upon art modelling as upon a delicate and distinctive treatment of hand-painting'. 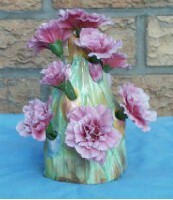 The colours used are mauve and lilac, pink and yellow, turquoise and pink. Examples known are candlesticks, spiky plates, muffin dishes, sandwich sets, tea-for-two sets, coffee sets, biscuit barrels, ashtrays, and bonbon dishes. . . . .
Coffee Set ..... Tea for Two .... . Jug. Mutton Crackle Vases/Jugs - Typically red, uranium orange, black, grey and white. Similar to pieces from Royal Lancastrian. Usually of a substantive weight of ceramic. Some have been labelled as 'Ming'. Figures - The picture is of the complete set and the figurines are clearly based upon the nursery rhythm, Tinker, Taylor, Soldier, Sailor, Rich Man, Poor Man, Beggar Man and Thief. The character's status is handwritten underneath. 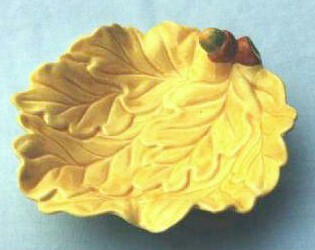 Colour Ware Found in Yellow, Green and Pink - Moulded ware in a leaf or crazy paving pattern. Similar to some Crown Devon however pieces are easily distinguishable by being a bright colour. Some pieces have orange fruits with a black spot on the fruit or a vegetable. The rest of the pictures are examples of ranges that have been found. Whilst some of these fall into the Art Deco criteria they are seen as other ware. They are by no means definitive and other examples are always being sought. If you find anything that is not described please forward information via an e-mail so that the site can be updated. Willow - found in the traditional blue and occasionally in red and in a not so common green. From activity on US web sites it would appear that this is where a lot of this ware was sent. These pieces are all marked as Royal Venton - 'Willow Ware' and the blue is usually much darker than the earlier willow ware. India Tree - a few samples of the classic India tree have also been catalogued. Also some 'Oriental' designs. Hunting Scenes - To date only a few examples found in the UK but many pictures are sourced from the United States. The pieces have a very distinctive back stamp either featuring a Huntsman, Dog or Fox. Colours found are red, green, blue and black. 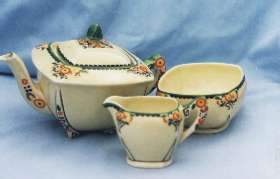 Jug & Bowl Sets - Several of these sets have been found and if fully complete would consist of a jug, bowl, toothbrush vase, soap dish with a lid, and one or two chambers pots. There would also be an associated dressing table set, They consist of tray, hat pin stand, ring tree, ring pot, and a pair of candlesticks. The production must have spanned through the Art Deco period as the example shows. 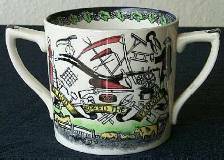 Mugs - An unusual 'Loving Cup' is shown featuring a Farmers rhyme on the reverse. Hathaway's Cottage - similar to the inns scenes but all featuring the same cottage. Poppy Ware - seems to have survived particularly well. It is mainly a printed pattern, but then hand finished. 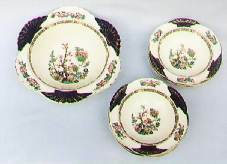 Pieces include trefoil dishes, comport plates, sandwich sets, meat plates, flower bowls, rectangular and round fruit serving dishes and a jug from a washstand set. The Seasons- Springtime and Autumn are known- Labelled as such on the reverse side. Commemorative Ware To date one plate has been found. This features the Birmingham Co-operative Society. 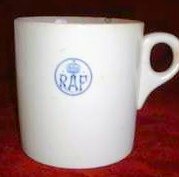 More Recently a mug issued to the RAF has been found on the e-bay site. Someone else has e-mailed a piece with the motto of the Staffordshire Police on the side as shown. Also a Coronation Mug. 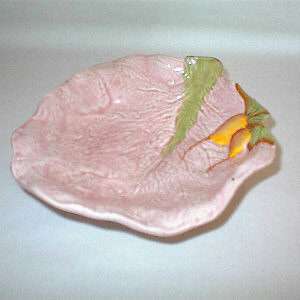 Dinner Services - Bird of Paradise was one of the mainstays but many other ranges have been found. 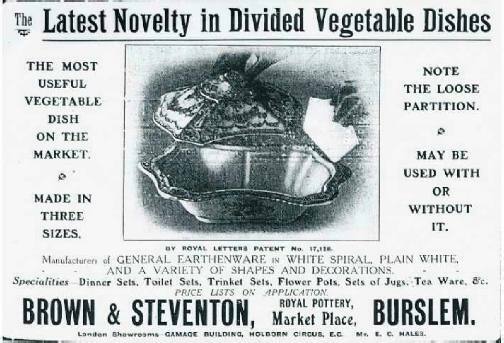 Some were made for particular outlets such as a vegetable tureen found in green and gold and back stamped 'Exclusive to Harrods, Knightsbridge, London SW1'. 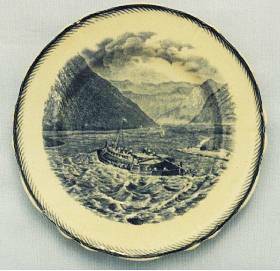 The Pottery Gazette makes mention of the production runs of Hotel ware and it is known that some wares were specifically made for the Railways - i.e. Great Western. Holdcoft is shown to have designed some pieces. 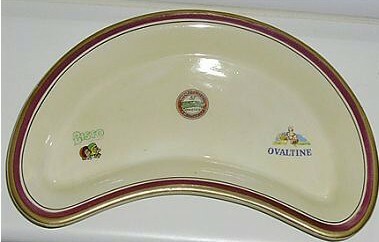 Commercial Ware Also some ware was made specifically for the London department store Harrods which bears the logos of Bisto, Ovaltine and Heinz. Railway Ware Several Railway companies commissioned ware for catering. General Ware There are also many other examples of the production that are not as easily categorised and these are grouped together as general ware. Many of these pictures have been sent to the Author and others have been found via internet searches. Where possible permission has been granted to post on the site. However if any infringe copyright then please do not hesitate to email asking for removal. It is hoped that all these picture help promote and record for prosperity the amazing range of designs and styles that the company produced. So little is in print and the author wishes to share all this information and there is no commercial gain from any of it. Buying and finding: One of the best sources for buying the pottery in the UK is to visit many of the Antique and Collectors Fairs that are organised. One of the major Fairs is at Newark with another at nearby Swinderby. Many of these images used have been 'captured' from the Internet and generally people have very kindly given permission to use them within the pages. Other images have been directly e-mailed. If there is an image for which permission to use has not been confirmed and you wish it to be removed from the site, please do not hesitate to contact as below. Hopefully you have enjoyed this site and learned something from the information within. The author welcomes any further information or statements about the pottery so that it can be added to the enjoyment of those people who have chosen to collect some of the ware. If you just wish to make a comment or pass on any information then use the book below. For a response please ensure that you include your e-mail address.